Hi this is Terri Borman, child care provider and author of the children’s book “Shapes Go to School.” This book teaches children shapes, colors, and diversity. It also helps children to understand that everyone is hard wired differently. This week’s blog is about those children that are hard wired with Autism and how service animals are helping to change their lives. Autism more often than not affects the child’s communication and social skills. The child will also more than likely have some sensory issues. Children with Autism are often nonverbal, and if they are verbal, they may choose to not communicate with other people. Some children with Autism will not respect another child’s personal space or follow rules which can be confusing to playmates. Loud noises tend to upset children with Autism and some children will do certain repetitive behaviors, called “stimming.” Some behaviors are calming to them such as hand flapping; and some behaviors are potentially dangerous like head banging. Autism service dogs can alert their handler of their “stimming” and then it is up to the handler to choose a different “stimming” behavior or stop “stimming” altogether. A very structured routine is important to children with Autism. When their routine is changed, they will most likely be stressed and agitated. Children with Autism are also not big fans of waiting. Applied pressure by using weighted vests or blankets can be very calming to children with Autism. However, they are bulky to carry around. 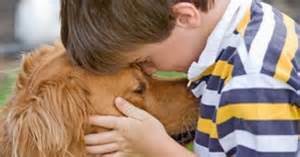 Autism service dogs can be used to apply the pressure. Children with Autism will not typically respond to their names being called and they have no real sense of danger. They could easily wander off by themselves, go willingly with a stranger, or they may walk right out in front of a moving car. Remember how I said loud noises upset children with Autism? A smoke detector has a loud piercing tone which sends a message to us to exit the building quickly. This message is not received to a child with Autism and because they are nonverbal and do not respond to the call of their names could be life threatening in a fire with heavy smoke. Autism service dogs could guide their handler to safety or could be trained to find a specific person, perhaps a caregiver, if their handler was in trouble. This entry was posted in Uncategorized and tagged Autism, children with Autism, light it up blue, service animals for the Autistic, service dogs, World Autism Awareness Day on March 23, 2014 by terriborman. Hey mate ! I just saw your web-site and all I can say is that is really nice. Lots of useful tips on it. I furthermore see that you do not rank very high in the searchengines. take your website higher in the search engines – http://alturl.com/em44o -.